Once in a while you'll come across a video whose image has been mirrored or flipped horizontally. Often one does not notice any difference in the video up until some text like titles or captions are come onto the screen. It's here you realize the video has been mirrored. The usual suspects here tend to be videos uploaded on video sharing sites like YouTube and Dailymotion. I assume this happens either due to purposefully or by mistake using a miror effect during recording/editing a video. Whichever the case, some videos are rendered slightly unwatchable in this state. To correct this, one may be forced to re-edit the video on a video editor though some video converters do support this. However, this is too drastic a measure that can be rectified much easily by having a video player unmirror/unflip the video "on the fly" while its playing it. Let see a couple of Windows' video players that support this feature and how it's done. 1. Open the video with the VLC and pause it or leave it playing. 2. Press Ctrl+E to open the Adjustments and Effects options. You can also access this option by clicking the Extended Settings button or by going to Tools > Effects and Filters on the toolbar. 3. 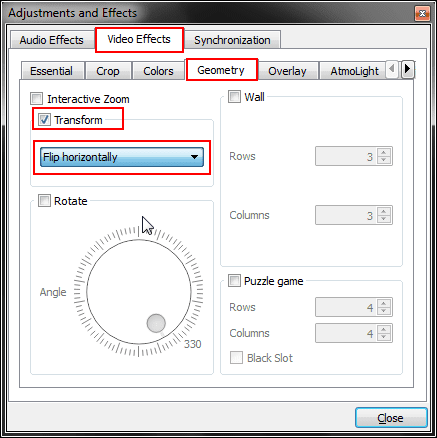 Inside the Adjustments and Effects window, select the Video Effects options then Geometry settings. 4. In the Geometry settings check the Transform option then below it select Flip Horizontally from the drop down menu. Your video should now be unflipped. Remember to disable this option when you play a normal video that's not flipped. 1. Open the video with Potplayer. Before we can flip a video with MPC-HC, we first need to make sure the renderer it's using supports rotation. 1. Go to the Settings (O) then select the Output settings. Now just make sure the renderer that's selected supports the Rotation option. 3. Now just open your video and with the Num Lock On press Alt+Num6 to unflip it. Press the same keys to toggle the setting back to normal. 1. Open the video with GOM Player. 2. Now just press Ctrl+J to unflip or flip the video while its playing. You can also unflip the video by Right-clicking > Video > Mirror - Output.